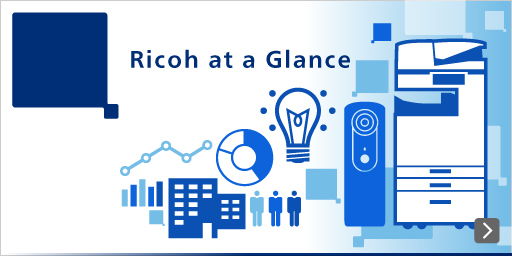 Ricoh has developed an innovative technology that connects information on paper (the physical world) with digital information or services on the Internet (the digital world), adding value beyond the printed page. What is Ricoh Visual Search (RVS)? RVS technology establishes the relationship between information on printed paper with digital information and services on the Internet. This technology has been developed by Ricoh Innovations Corporation in Silicon Valley, U.S.A. RVS replaces unsightly two-dimensional bar-codes and QR codes and instead establishes link areas to any portion of a document before or after printing. It offers a flexible and natural connection between paper media and digital content or services and offers the potential of new applications and services. 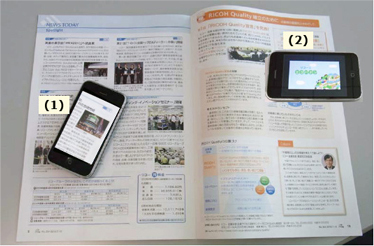 As an example, capturing a portion of a magazine article with a smartphone camera, the RVS server provides relevant on-line information and services related to article (Figure 1). The RVS process is as follows: an authoring process enables data associated with the article to be uploaded to the RVS server. The captured image is sent to the RVS server and identified. Digital information related to the captured image is located and provided to the user' s smartphone. (1) Capturing a part of a magazine with smartphone camera. (2) Document is identified in the database and the related information is sent to user' s smartphone. RVS technology has the following key features that can support a wide range of applications. RVS technology includes innovative recognition algorithms, data authoring and search technologies. 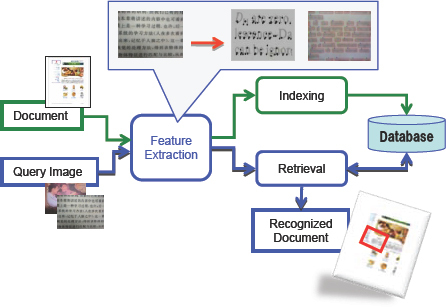 The recognition technology uses image characteristics of printed/captured image similar to fingerprint matching recognition (Figure 2). RVS technology is applicable to publications and any kind of printed media including newspapers, magazines, books, brochures and posters. All types of digital information or services can be linked including multimedia content, web sites, e-commerce services or social network services. Video 1 introduces an application linking a driving manual to an on-line video, clearly explaining driving skills. This kind of application allows users to obtain more detailed information which is difficult to communicate on paper. Additional applications include linking content of a brochure to e-commerce sites. For example, by capturing an image of a product in a mail-order catalogue, you can review detailed information on your smartphone and instantly purchase the product. This combination of printed content and digital information provides updated information and allows an easy and quick method of purchase. Finally, RVS technology can add additional information and services after printing. As an example, after capturing an image of an exhibition program on a smartphone, additional information including audio comments or text can be captured and associated with this image. RVS can then be used as ‘sticky note' enabling these comments to be retrieved at a later date. This type application allows an easy way of managing information with mobile devices.